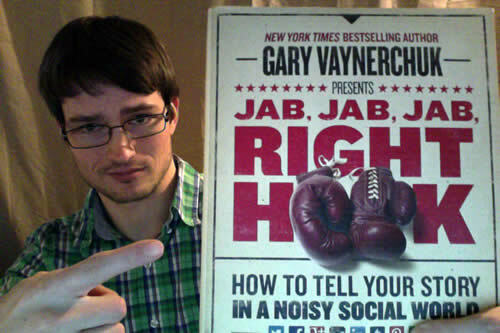 If you are a network / internet marketer, or just simply interested in the potential of using social media to grow your business… then you absolutely owe it to yourself to read Gary Vaynerchuk’s latest book “Jab, Jab, Jab, Right Hook: How To Tell Your Story In A Noisy Social World”. Whether you are in the trenches and still learning (like all of us really) or first getting into learning the concept of marketing online via the social media platforms, you will speed up your progress by simply exposing yourself to the wealth of valuable information that Gary has sunk into this book. You eyes will open wide and with ‘aha’ moments on every page. This book is a treasure trove of eye popping information that will help you to maximise your efforts on whatever social media platforms you are using to market online… this is literally a MUST READ for every marketer out there, and I will explain why in my review! 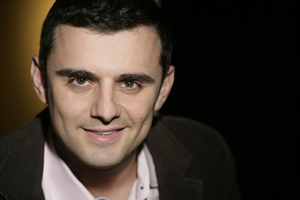 If you are a network or internet marketer, then it’s very likely that you have at some point heard the name Gary Vaynerchuk. Gary is one of the most highly respected Social Media Marketing entrepreneurs, and has very high name recognition in the industry. He was one of the first people to figure out how to monetize YouTube for business through ‘Video Blogging’. 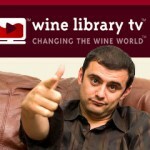 Gary produced a hit YouTube video blog called ‘Wine Library TV’ where he brought a new approach to the world of wine tasting review. He brought realness, a willingness to buck the trend and let us know how he felt about different vintages through everyday language that we can relate to… not the same stuffy approach with nonsensical terminology typical of self proclaimed wine tasting experts. In doing this he brought his personality and humor to the table, which ultimately sold in a big way as he successfully expanded his Mom & Pop’s little liquor store into a multimillion dollar business! And at the same time, he inspired a movement of social media marketing on the internet for business… as other entrepreneurs watched him as an example of what could be done. 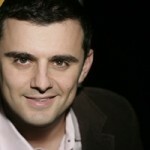 Post his breakout success on YouTube, Gary founded his very own marketing firm called VaynerMedia. Through his books and online presence, Gary has continued to be a valuable source of information and inspiration to social media marketers all across the world and the internet. Gary draws a metaphor between the art of social media storytelling and boxing. In the world of marketing, it’s a classic cliche where professional marketing firms present their plan to the corporate board of director’s with their latest campaign will be the equivalent of a ‘Knockout Punch’. And the only problem is that so many times, what has seemed like a sure thing in the board room ends up either wildly succeeding or straight up flopping. The problem is that an environment needs to be set up where the knockout punch can be delivered. Just like a skillful boxer, the marketer needs to set themselves up for success with a series of ‘jabs’ (supporting content). These smaller marketing initiatives are planned strategically to set up for the ‘Right Hook’ (killer content) which could turn out to be your next ‘Knockout Punch’ that puts you leagues ahead of your competition. So it is important to understand the nuances of how to tell your story natively on your social media platforms of choice. Telling your story native to the platform means that you know how to format your posts or content in such a way, that they feel natural and at home on the platform. For example on Facebook, your most effective posts will have an image that is congruent with the story of your post… the visual aspect of the post draws eyes to your information and as long as you strategically place your link in the post (preferably above the fold, without having to click ‘read more’) then you will raise your chances significantly of driving traffic to your website or offer. But you can be even more strategic by providing value over a series of posts, which we call ‘jabs’. Then you follow these efforts with a more profound post, which includes an eye catching and related image and a clear call to action that gets your readers to ‘click the link’. 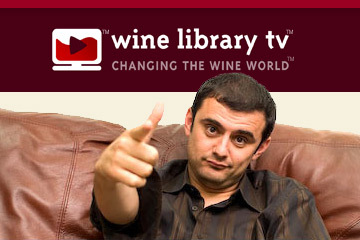 Gary Vaynerchuk Gives Us 12 Rounds of Training In Social Media! I’m just scratching the surface here to give you an idea of the type of value that Gary has to offer in this incredible book. 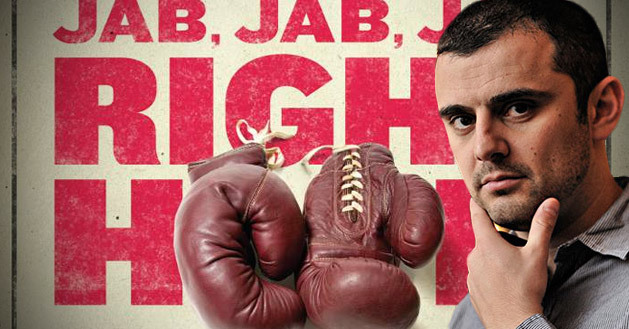 Jab Jab Jab Right Hook is broken up into ’12 Rounds’ (chapters, continuing the boxing metaphor) in which he goes over every single relevant social media platform we have available today. He does not stop short at merely making us aware of them, but he provides solid strategies and valuable insights on how to work them effectively to grow your business. In each ‘Round’ he provides a case study of how the Fortune 500 companies are using each social media platform. He shows us where they go wrong, where they go right… and why! He literally takes posts from the platform and details in text and images what is good or bad about each effort by these companies… and he even re-does the poor efforts and shows us how he would re-approach the same post with his strategies for success. In ‘Round 3’ which is all about Facebook, there is a 36 page section of these post critique that will help you learn how to raise your game on the most popular social sharing platform to all new levels. One of the most important things to understand is that it’s not just about the content… it’s about the context!! It’s all about how you can wrap your posts up in a nice little bow, that is ready to be consumed by the users of the social media platform you are storytelling on. And of course to find unique ways to spin your content to relate with pop culture and current events, for even greater mass consumption! In the other sections of his book, he goes into detail on social media platforms such as: Twitter, Google Plus, Instagram, Linkedin, Tumbler, Pinterest & Vine. In one of the final rounds of the book, he goes into detail about the emerging social networks that we need to have our eyes on with plans to engage. Gary explains that in the world of social media there is a 90-9-1 rule… 90% of internet users consume content, 9% edit it, and 1% create it. Now which percentage do YOU want to be a part of? If you are reading this review then you very likely know where the money is at. And you’ll also realize how wide open the market is for those who get deep in the trenches and produce quality content! In the first quarter of 2014 there were over 350 million mobile subscribers in the United States alone. Facebook is now a Mobile Company, as the mobile future could just not be ignored. Right hand column ads on Facebook are becoming obsolete as there are not nearly as many laptop & PC users. Mark Zuckerberg initially rejected the idea of photo sharing, but was convinced by ‘then President’ of Facebook Sean Parker. There were 680 million monthly active users of Facebook Mobile as of Dec. 2012. Advertising is now done through ‘micro content’, trending stories and sponsored posts / stories. Facebook gives us the opportunity to get to know the ‘likes and dislikes’ of our customer base, allowing us to make more strategic posts and giving the ability for us to target subsets of the overall customer base. Did you know that ‘Sponsored Posts’ on Facebook will get your post out to more of your network and possibly spark re-engagement with old connections and fans? So What Are You Waiting For? Put Your Gloves On And Get In The Ring! There is so much potential out there for you as someone who is open minded to the possibilities of marketing on Social Media. And it’s all about learning how to become an effective storyteller on each platform you decide to leverage. And with all the emerging social media platforms that are growing at a rapid pace, there is a ton of potential for growth. All you have to do, is be one of the people who get in the ring early and learn how to best leverage them for your business. You will then rise to the top as these emerging social media platforms gain in relevance through mass adoption. And there is still worlds of potential on the already established platforms such as Facebook and Twitter, because the truth is… there are so many people out there trying to market and completely failing as they throw ‘right hook after right hook’ (attempts at killer content), not understanding that proper jabs (supporting content) need to be delivered before anyone will start paying attention to the ‘right hook’. There is a lot of room for those like us, who invest ourselves to expand their knowledge and be more effective in the marketplace. And you can get a headstart on your competition by grabbing a copy of Gary’s book TODAY! If you enjoyed my book review and now find yourself excited to pick up a copy of Gary’s latest masterpiece… you should not hesitate any longer and pick up a copy for your home business library. You’ll thank me for it later! P.S. If by some crazy chance you are not convinced yet about the value of Gary’s new book, then you should watch this video where he the importance of storytelling and why people need to stop telling stories like it’s 2007 in a 2014 world. Enjoy! Hello my friend! It's been a minute, but I thought you'd find this article very interesting so just forwarding the info along to you. 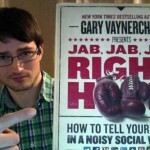 The article is called Jab Jab Jab Right Hook By Gary Vaynerchuk: A Book Reviewand is located athttps://www.meetcalebwright.com/network-marketing/jab-jab-jab-right-hook/. Let me know what you think! Aweosme, this guy seems to be way ahead of the curve and knows where things are headed before everyone else does; buying the book was a no-brainer! YES! Gary Vaynerchuk is certainly at the forefront of the latest and greatest in social media marketing and is definitely someone to follow. Thank you for enjoying my review and providing your feedback! Outstanding blog review Caleb. First, great content, well-written, and properly structured. This book is awesome! For current Entrepreneurs this is a must have! Keep up the great work! Thank you Kevin, I appreciate the feedback! This is definitely a must read for anyone who is marketing online with social media!